Based on the novel by Erich Maria Remarque, All Quiet on the Western Front is the story of soldiers in the German army adjusting to the horrors of war during World War I. Directed by Lewis Milestone and screenplay by George Abbott with story contributions from Maxwell Anderson, Del Andrews, and C. Gardner Sullivan, the film is a war movie that play into the realities of war as well as the chaos that looms for young soldiers in World War I. Starring Lew Ayres, Louis Wolheim, John Wray, Arnold Lucy, and Ben Alexander. All Quiet on the Western Front is an astonishing yet haunting film from Lewis Milestone. The film follows a group of young men who join the German army during World War I with a sense of idealism of heroism and fighting for their country only to encounter the realities of war face-first. It’s a film that play into the ideas of war and what it means to serve a country but also the questions of why wars happen and why these young men have to fight over something that could’ve been avoided. George Abbott’s screenplay starts off with these young men at a classroom urged by their teacher to fight for Germany in World War I as a source of pride and honor to their country. Instilled by this idea as well as the images of soldiers marching with a marching band and people waving the flags at them. The film’s protagonist Paul Baumer (Lew Ayres) makes the decision to join as he thinks he would come a war hero and be beamed with pride by his family. When he and other soldiers who are also classmates arrive at camp where they’re trained by an abusive corporal they use to know. They’re still having these ideas of glory as the film’s second act takes place on the battlefield where reality finally comes face first. During the course of their time dealing with hunger, fighting on the front, and waiting for the battle to happen and such. They start to ask questions about why they’re fighting and what caused all of this to happen. Even in a scene where Baumer is trapped in a hole during a battle where he finds himself meeting a French soldier (Raymond Griffith) he just stabbed as it’s a moment where it play into the many fallacies of war. For Baumer, he deals with these realities as well as become disillusioned once he sees those he knew be killed or wounded as it add to this air of despair. Lewis Milestone’s direction is intense for the way he captures the horrors of war as well as opening it with this air of idealism with this wide shot of a vast number of soldiers marching in the background while Professor Kantorek (Arnold Lucy) is giving this impassioned speech to his students about the ideas of war. Shot on location in soundstages in Hollywood, the film does play into this conflict of the romantic ideals of war and the reality as the first act is about the former with young men dreaming about wearing uniforms with medals. Even as they have to deal with Corporal Himmelstoss (John Wray) during training as they know he’s someone they don’t take seriously with his stylish mustache and the fact that they used to know him. Upon arriving into the battlefield, Milestone’s usage of wide and medium shots come into play with the latter playing the bond between soldiers inside the caves as they try to cope with cannon fire and bombs. The battle scenes are riveting in the way it play into this air of horror where Baumer watches a friend be killed or a man killed by a bomb. That air of intensity showcases the magnitude of war as well as the fear of who might die in the next battle. The dramatic elements, which would include additional yet un-credited direction from George Cukor, that play into the soldiers talking with each other are shown in medium shots and close-ups with Milestone framing the actors to showcase their emotions as well as their growing fear over when the next fight has to occur. The scene where Baumer meets the French soldier play into not just the fear but also the sense of humanity that looms over Baumer as he realizes whom he had just stabbed and what that man might go home to. While much of the dialogue in the film isn’t heard due to the technology as there would be intertitle cards in between some of the dialogue, Milestone does play into the drama as it include a scene in the third act where Baumer is given a chance to return home briefly as it all goes back to this romantic idealism that had been instilled upon on. Yet, it is challenged by what Baumer saw as it is this anti-war sentiment that proves to be engaging as he also knows that there’s a chance that he might die upon his return to the battlefield. Overall, Milestone crafts an eerie and rapturous film about young soldiers dealing with the horrors of war. 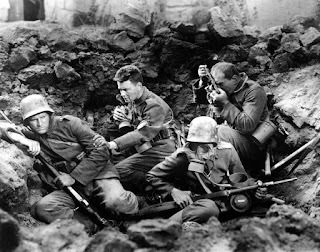 Cinematographers Arthur Edson and Karl Freund do brilliant work with the film’s black-and-white photography from the way the battle scenes are light in day and night as well as the naturalistic look of the non-battle scenes in its exteriors and interiors. Editors Edgar Adams and Edward L. Cahn do excellent work with the editing as its usage of rhythmic cuts play into the action as well as the air of suspense that looms of what happens in battle. Art directors Charles D. Hall and William R. Schmidt do amazing work with the look of the classroom in the film’s opening sequence as well as the underground caves and some of the places the soldiers go to. The special effects work of Harry Lonsdale is fantastic for the way it play into usage of explosions for the scenes of war as well as photographic effects to help capture the intensity of the battles. Sound recordist C. Roy Hunter does superb work with the sound as it play into the sounds of cannons, gunfire, and bombs to play into the chaos of war. The film’s music soundtrack by David Broekman provides a wonderful mixture of score music from various composers including variations of music by Franz Schubert and Ludwig Van Beethoven. The film’s incredible cast include notable small roles from Beryl Mercer as Baumer’s mother, Marion Clayton as Baumer’s sister, William Irving as the army cook who refuses to give the company double rations, Walter Browne Rogers as a friend of Baumer in Behn, William Blakewell as another friend of Baumer in Albert Kropp, Raymond Griffith as the French soldier Baumer wounds and tries to heal, and Slim Summerville as a soldier who keeps feeling underappreciated in Tjaden. Ben Alexander is terrific as Franz Kemmerich as a soldier who gets his leg amputated as he asks Baumer to be at his side over the fear of dying. Arnold Lucy is superb as Professor Kantorek as Baumer’s mentor who would instill these ideas of patriotism and romantic heroism into Baumer and classmates only to be later seen as just false propaganda that is far removed from reality. John Wray is excellent as Corporal Himmelstoss as Baumer’s drill instructor whom he knew a long time ago as he is a man that is abusive and barking orders but has no real sense of reality once he arrives onto the battlefield as he’s treated by soldiers with indifference. Louis Wolheim is amazing as Stanislas “Kat” Katczinsky as this grizzled soldier whom Baumer and other soldiers see as their big brother as a man that has seen and been in war as he would be Baumer’s great mentor in surviving and dealing with the chaos of war. Finally, there’s Lew Ayres in a brilliant performance as Paul Baumer as a young soldier who arrives to training camp and war with a sense of romantic idealism like many other soldiers only to deal with the chaos and realities of war as it would harden him as well as have him return home briefly to reveal truths about what really goes on. All Quiet on the Western Front is a spectacular film from Lewis Milestone. Featuring a great cast, eerie visuals, intense sound effects, and strong anti-war themes that remain relevant to this day. It’s a film that show the fallacies of war and the false ideas of patriotism that still carries on over what really happens and why it should be avoided. 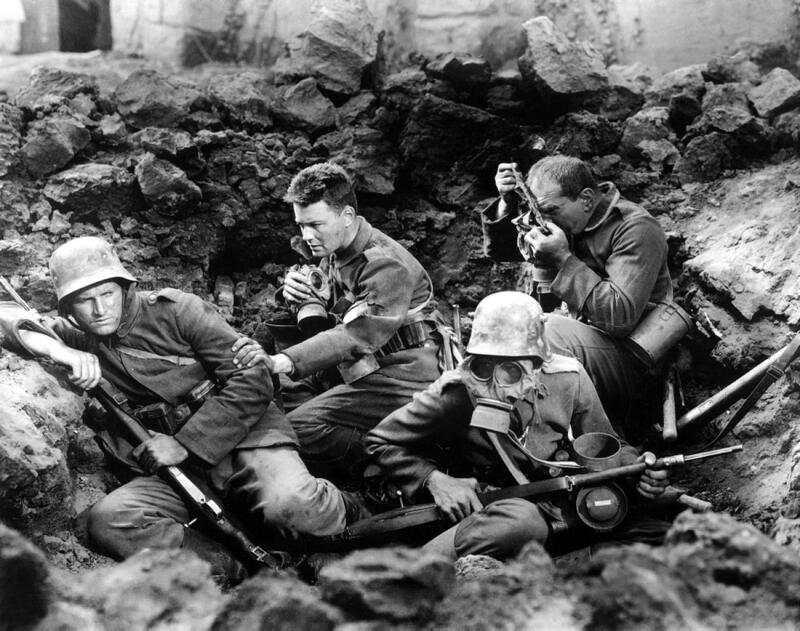 In the end, All Quiet on the Western Front is a phenomenal film from Lewis Milestone. This one is a blind spot for me, too. I need to get on it. Sounds like a brutal war movie, good review. From the title I always thought it would be quite heavy, and it's a blind spot for me, too. @Wendell-It's certainly worth watching as I knew it was a film I had to see but it's really more of an anti-war film as I would pair this one up with another anti-war film set in the same war in Paths of Glory. @Sofia da Costa-It is brutal to watch at times due to its realism but it is certainly a must-see for anyone that wants to see what kind of films were made during the pre-Hayes code era in American cinema as this was a film later banned for its anti-war sentiments in several countries. I haven't seen this either. I realized during a TMP topic that I've barely seen any films that deal with WWI compared to what I have for WWII. @Brittani-It's true that there's not a lot of major films revolving around World War I as I'm sure there's many about that war that I haven't seen as the only film about World War I that I know of and actually hold in high regard is Paths of Glory by Stanley Kubrick. My Grandpa introduced this movie to me years ago and it really made an impact on me. @vinnieh-Your grandpa is awesome to know that he showed you this incredible film. It's truly one of the finest that I had ever seen.